The fastest pig you’ll ever get sick from. Way back in 2009, swine flu was the scariest thing imaginable for a whole lot of people. Everyone was scared of swine flu, from Santa Clauses who demanded vaccine priority to entire countries, who turned to folk remedies to ward off the dreaded disease. Well, guess what? It’s state fair season, and with fairs comes… that’s right, swine flu! There have been a dozen cases of H3N2v swine flu at state fairs in Hawaii, Indiana, and Ohio, and authorities warn there might be more swine flu out there. Of course, H2N2v isn’t the H1N1 virus that apparently killed thousands across the world in 2009, but still, precautions should be taken. For example, don’t touch pigs if you can help it. If you do have to touch pigs, wash your hands afterwards and don’t rub your mouth or face with your pork-flavored hands. 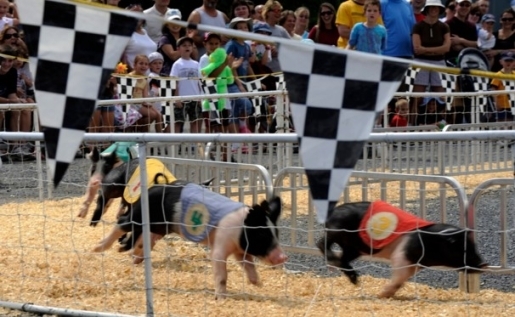 Odds are the fair near you won’t have a petting zoo for the kids; even if it does, odds are you don’t have swine flu. There have been only 39 cases of swine flu in the United States since 2011.